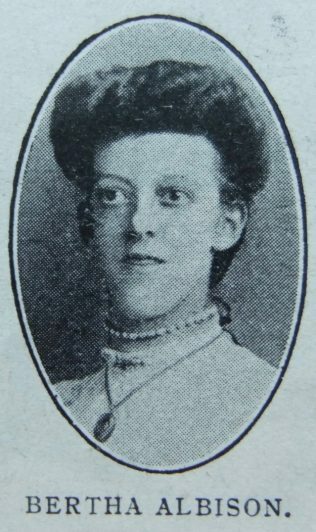 HURST BROOK Church and Sunday School in the Ashton-under-Lyne Circuit were sorely stricken by the death of Miss Bertha Albison. Though originally a scholar at Katherine Street her best work had been put into the little cause that taught and worshipped in the old chapel, Whitworth Street, Hurst, now superseded by a better sanctuary in Ormonde Street. The building of these new and better school premises was an object on which she had long set her heart, and for which she gave and gathered scores of pounds. It added to the pathos of her passing that on the eve of their opening, she had to enter the infirmary for a much-needed operation, from which she never recovered, and so passed away without beholding their completion. Appropriately enough one of the corner-stones bears her name, and her portrait, subscribed for by many loving friends, adorns the schoolroom walls. In choir, Band of Hope, Sunday School, and C.E. work she counted amongst the foremost and the best. But though in labours more abundant her supreme service was not in what she did but in what she was. Her gracious, winsome personality was a benediction to all who knew her. Hearts still soften and eyes still moisten at the mention of her name. Her example is an inspiration and her memory is an ointment poured forth. Bertha was born abt 1886 at Ashton-under-Lyne, Lancashire, to parents Ralph and Mary. Ralph was a stripper and grinder in a cotton mill. Bertha worked as a cotton weaver. Bertha’s death was registered in the third quarter of 1912.